An impressive comeback from Bedford Athletic saw them earn a bonus point victory with a 26-20 win at East Midlands rivals Kettering. Trailing 20 points to 5 early in the second half, it appeared that the odds were stacked against them but perseverance, character and composure saw Athletic score three tries without reply to seal their success. Bedford scored the first try after nine minutes when an attempted a clearance kick from the base of a ruck went straight into the arms of Sven Meiland who fell over the line. Kettering’s response was immediate as an infringement by the visitors allowed Shane Ling to kick the penalty and narrow the gap to 5-3. Ling gave the home side the lead with a penalty after 36 minutes and Kettering finished the half much the stronger, scoring a try on the stroke of half-time which Ling converted for a 13-5 half time lead. Bedford Athletic upped the intensity at the start of the second half, but Kettering’s Damien Conyard raced away for a try which Ling converted for a 15-point lead. Bedford immediately set about the task of narrowing the gap, with a lineout catch and drive resulting in a converted try for Stefan Hughes-Brand on 48 minutes. 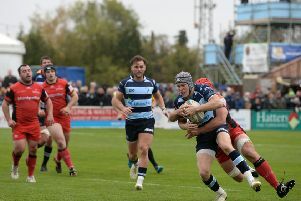 The turning point of the match came on the hour mark as Athletic broke from a Kettering five metre scrum and Charlie Darlow crossed for a converted try. The visitors were now in the ascendancy and Mortimer floated the ball over the last defender to Tommy Mills – making his 100th appearance for the first XV – who scored the winning try which Mortimer converted for a final score of 26-20.
for the international weekend before resuming action at home to Mansfield on 21st February.